Cooking (and eating) my way around the world, one meal at a time.. So tonight I have a dilemma. We are going out for dinner to talk house. That’s right, we just bought a house. It needs a lot of work. We’re stalling and don’t really know where to start hence the meal. Food was planned though. Its still being cooked. Don’t panic. 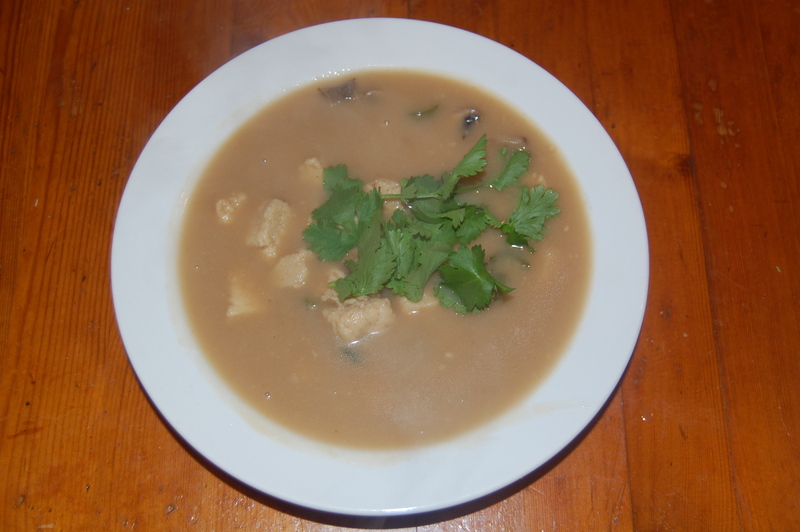 On the menu we have Tom Kha Gai; Thai Coconut Soup. Easy to make according to the recipe and I do love Thai. One of my favourite things to cook from scratch is my take on a Thai-esque curry. It’s easy enough to do and the local market sells a huge selection of asian ingredients super cheap. It is however my own ‘whack-it-all-in’ recipe so I thought it would be nice to find a traditional Thai recipe to test out. 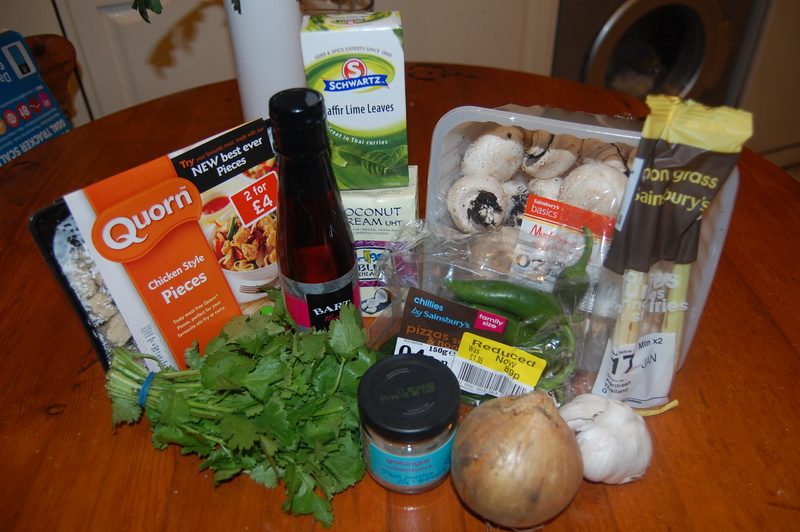 Also, until I can get to a real shop to buy in for the week we’re looking for minimal ingredient recipies. The recipe for today comes in two parts : Broth and Bits. I love chunky soup. 2 coriander roots, scraped ~ can substitute for a handful of coriander leaves and a pinch of coriander seeds. Some of this was quite hard to find in the local store, especially when you don’t really know what you are looking for so don’t really know where to look. I did have to substitute some things such as the galangal root for pureed galangal and coconut milk for cream though I did add more fluid to compensate for this. Also, I forgot to defrost some chicken so we had Quorn instead – it was nice and moist which seems to be a chicken themed issue. On with the recipe. I’ve downsized it word-wise as the recipe I was following was quite wordy and a bit all over the place. 1. Add to a saucepan the coconut milk, chicken stock, galangal, kaffir lime leaves, lemongrass, chilies, coriander, garlic, shallots, sugar and salt. 2. Bring to the boil and simmer for at least 15 minutes. 3. Sieve the broth to remove all the bits. These can be pureed and added back in if you wish, though I don’t really fancy it. 4. Add the chicken, mushrooms and baby corn to the broth. Cook until the chicken is cooked through. Top with fresh coriander leaves and serve. Hmm, I don’t know. If I were to make this again at some point, I would have to buy ‘real’ chillies from the market as the store-bought ones were rather average. The broth was nice but I think I prefer a thicker curry with some rice. TASTE – Sweet and salty, very thin. COST – Thai bits like the lemongrass etc seem to be some of the cheapest ‘World’ food items at around 80p each. DIFFICULTY – Not hard but a bit annoying with the faffing about sieving, switching pans, whizzing etc. adventures in self-love and soul searching..
"Je suis féru(e) de langues" is about language learning, study tips and travelling. Join my community!